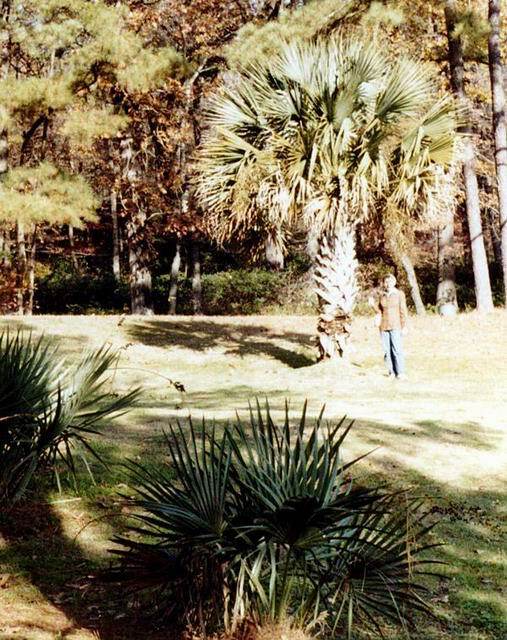 This mysterious Sabal palm has been the topic of much interest and speculation for many years. 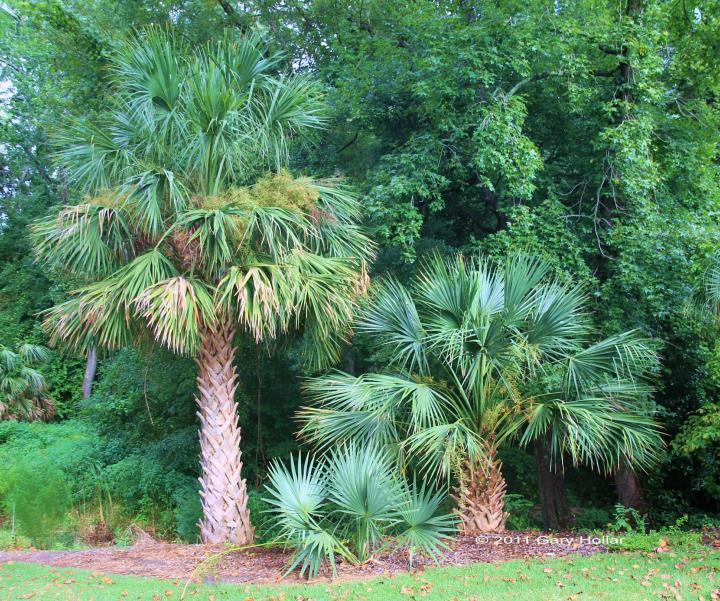 This palm was growing at the home of Miss Alexander in Birmingham, Alabama for many years during which time it endured many very low temperatures. The story goes that it was originally brought from California. Upon the death of Miss Alexander, this Sabal was moved to the Birmingham Botanical Gardens in 1976. 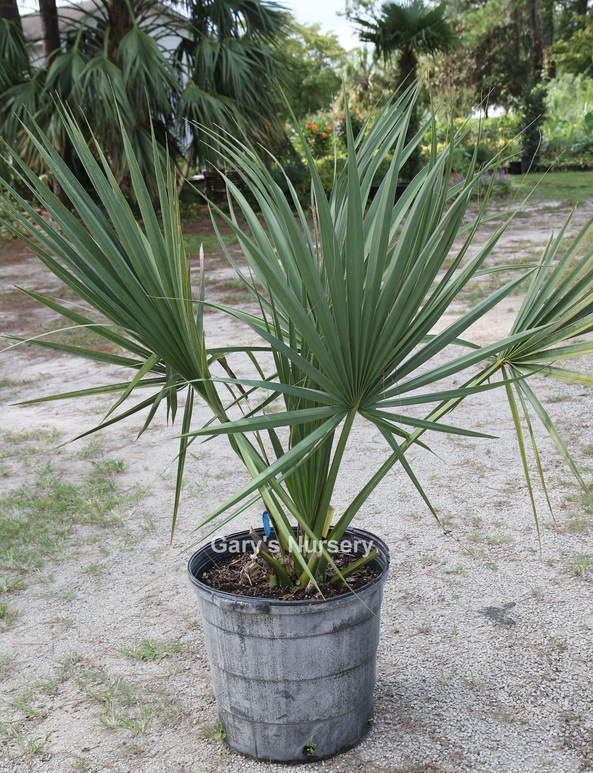 Speculation in the 80's put it as a Sabal palmetto x Sabal mexicana cross. Surely anyone who has grown these can see it is probably not a cross of two such fast and tall growing palms. Also in the 80's the late Bill Manley thought it to be a Sabal louisiana. 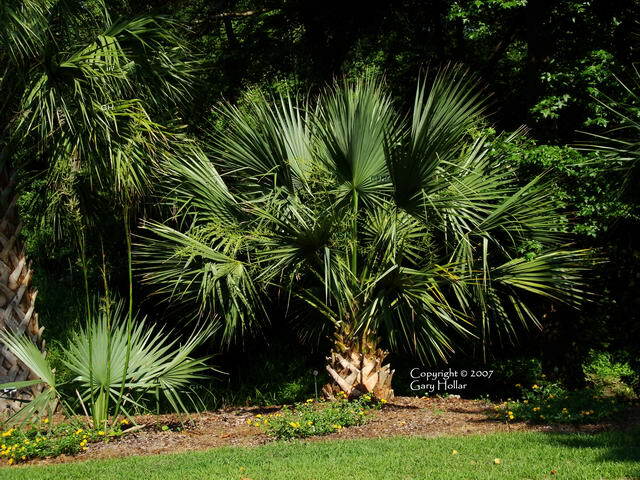 At one time it was labeled as a Sabal palmetto in the Botanical Gardens. 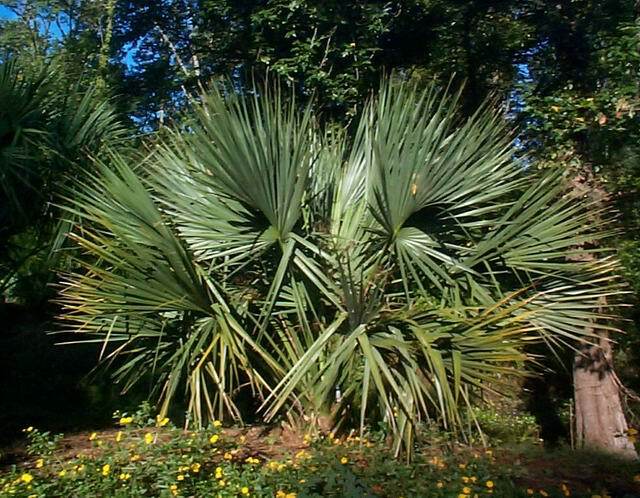 Some, including the author, who have grown it speculate that it looks more like a cross between something like Sabal palmetto and Sabal minor since it shares characteristics of both, but is very slow growing more like a minor. No one knows for certain what it is. 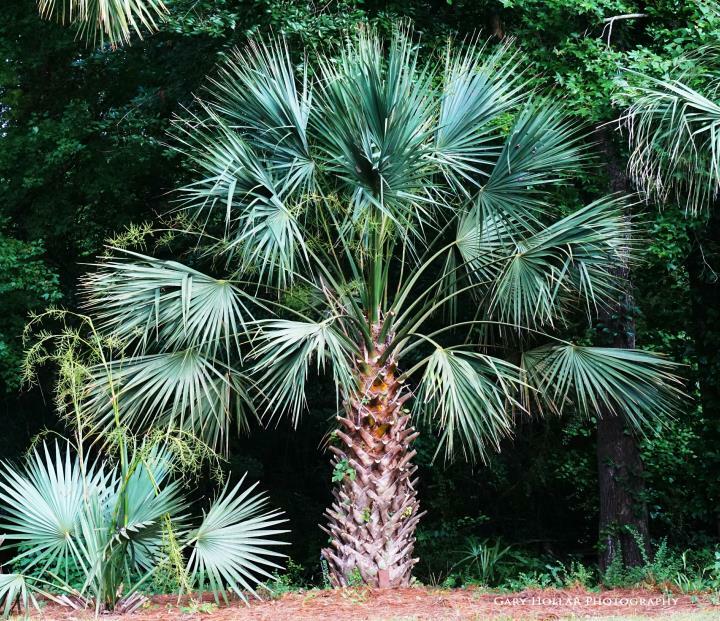 The original Birmingham tree later died in the 80's, but not before Bob McCartney of Woodlander's Nursery obtained seed and later offered small seedlings for sale which are now producing seed and keeping this mystery palm going. Whatever it is, it has been a very cold hardy palm with specimens enduring single digit or below zero temperatures in Tulsa, Oklahoma, Raleigh and New Bern, NC as well as other areas. Above: The Sabal Birmingham just starting to form a trunk in 1999. A brick in front for scale. Above: The palmetto on the left was planted as a seed in the Fall of 1986 when the Sabal Birmingham was already 2 years old. They were both planted in this location from a five gallon pot in 1991. As the years went by the palmetto really speeds up as the Birmingham continues to grow at a much slower rate. 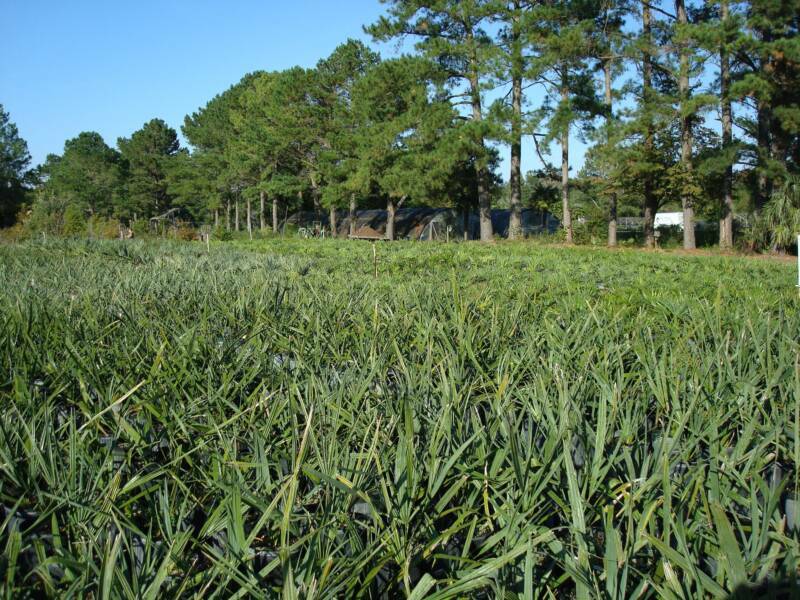 In the late 90's my largest Sabal Birmingham started to produce seed and Sabal Birmingham production was started here at Gary's Nursery. Above are some one gallon plants just transplanted to three gallon. These seedlings are 3 years old. After several weeks of very mild temperatures in January 2005, the temperature dropped to around 9 -10 degrees, with 36 continuous hours below freezing. 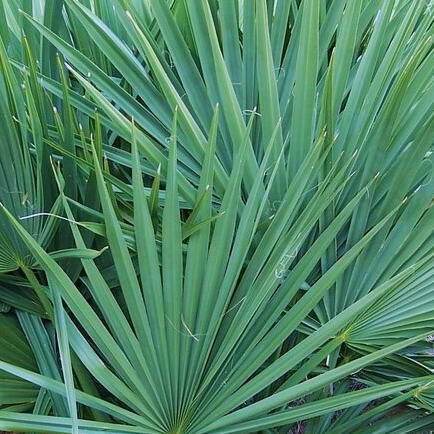 The Sabal palmetto has damage to old leaves as well as newly emerging ones. The Sabal 'Birmingham" has no damage. Tamar Myers with the original Sabal sp. 'Birmingham' growing in the Birmingham Botanical Garden several years after being moved from the former home of Miss Alexander in Birmingham, AL. Photo by Jeffrey Myers. Many thanks to Jeffrey and Tamar Myers for the use of the photo. produced here at Gary's Nursery near New Bern, NC. 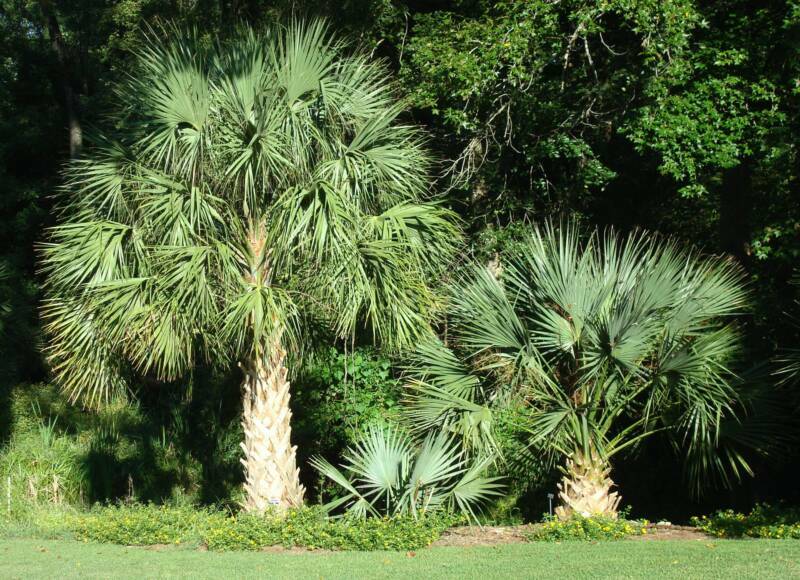 In the fall of 2008 the two years younger Sabal Palmetto to the left now greatly exceeds the size of the older Sabal "Birmingham" to the right. Our production of Sabal Birmingham greatly increased in the last few years to fufill the demand for this hardy palm. Sizes and prices are subject to change. The winter of 2010 / 2011 was not kind to some of the palmettos at my place with a very early 15 degree freeze in December after very unusual warm temperatures up until that very untimely freeze. All the palms were still growing rapidly up until that time. As usual the Sabal minor and Sabal Birmingham have no damage. Dr. Alan Meerow requested and was granted permission to use the above photo of mine in his 2005 book, Cold Hardy Palms, published by Betrock. 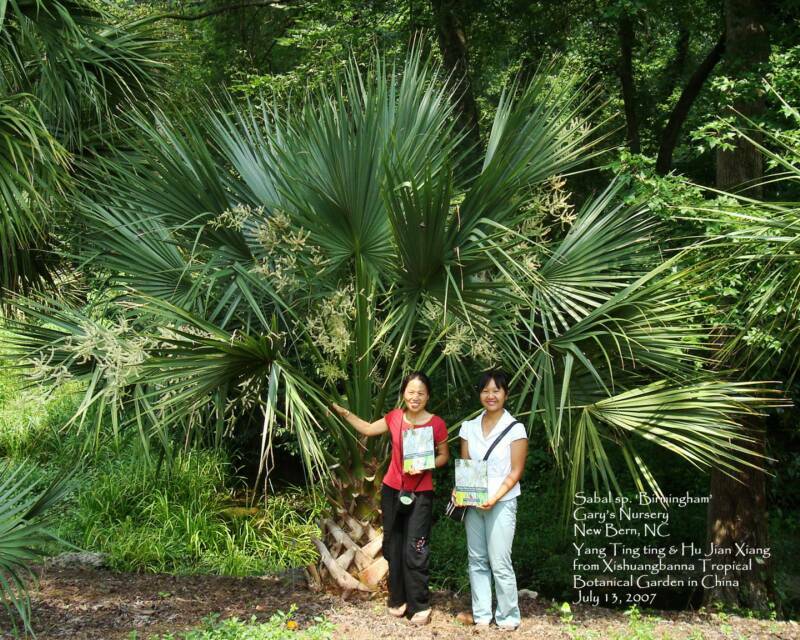 Two horticuluralist from a botanical garden in China came to visit the Sabal Birmingham and were fascinated with it. I presented each of them with a copy of the palm book published by the Southeastern US Palm Society which has my photo of it included and other palms that I have photographed here in NC. Sabal Birmingham in my back yard on June 28,2016. One of six seedlings ordered from Woodlander's Nursery in Aiken, SC.on November 24, 1986.